This article is in continuity with my previous article HTC Sensation Android Smartphone with ICS (Undocumented Features) : Part 2 Just in case you have not read it; it may be worthwhile to go through it and the previous Part 1 also before reading this one. In this article, I will be concentrating on the “People” application in HTC aka – Contacts. All images and names used in this Article belong to the respective manufacturers' devices and have been altered only to mask confidential data. I do not own them nor do I have any interest in taking ownership of the same. I am using them here so that the reader can easily follow what I want to say. This area does not hold a lot to discuss about because the phone has a very good “Setup” application that helps transfer data (Contacts, Notes, Messages, etc.) from most of the popular makes via Bluetooth. I have tried it and it works as desired. Your SIM may only support a maximum of 250 to 300 contacts. This may generate the need to swap the SIM 3-4 times if you have more 750 or so contacts. You may have multiple numbers for a single contact and the SIM will store only one Number per Contact. The SIM name field may support much less data than your phone, thus resulting in truncation of contacts having lengthy names. Other data like Email addresses, Company details, etc are out of the question and simply not transferable. Most of us have a Google or GMail account these days and this can be used a container to transfer contacts. Any other email service (like Hotmail) that supports “Microsoft Exchange Server” should do but GMail is a tried and tested solution and I prefer to stick with that. If you only wish to transfer your contacts, create a new GMail account just for this purpose (you may choose to delete it later), or proceed with an existing GMail account. 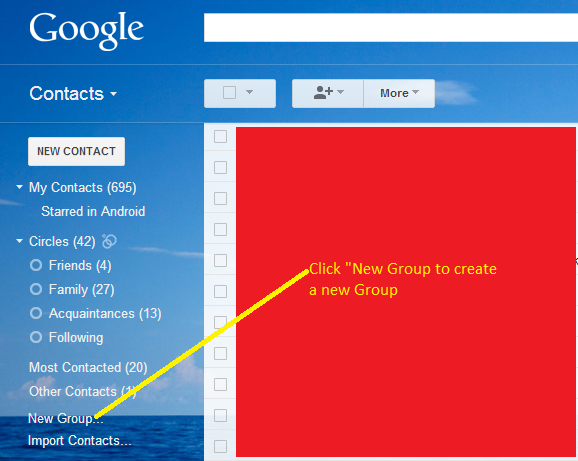 Move your existing GMail contacts to a newly created group, thus cleaning your main Contacts area. 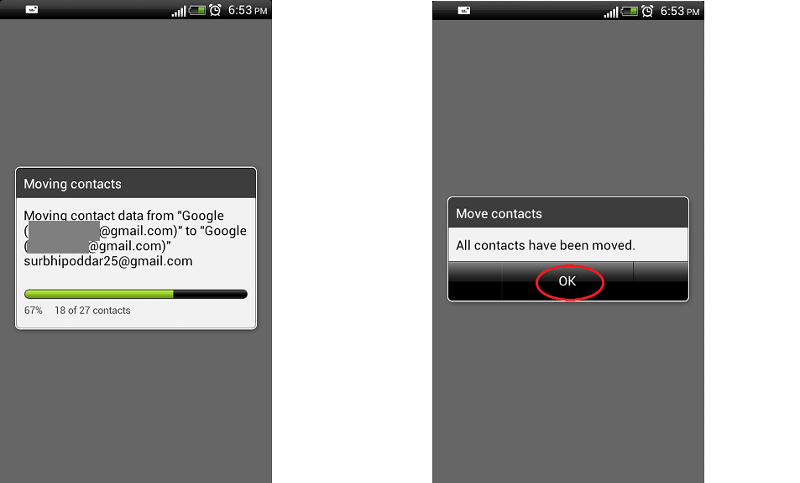 Step 2 – Setup your HTC Android phone to sync with the GMail account. On your phone, create a new Sync Account with the GMail account credentials. 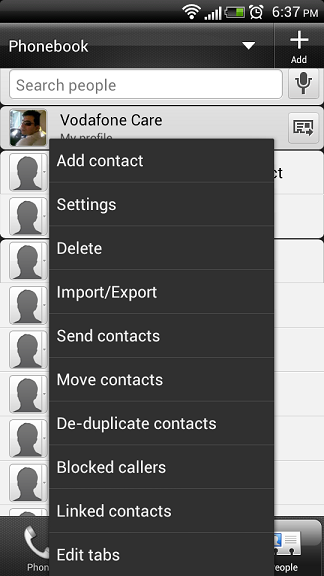 Open the People Application and select “Move Contacts” from the context menu. This gives you the option to choose the account that holds the contacts that you wish to transfer (which should be “Phone” in our case). Select the GMail account that we set up for transferring contacts on the next screen. Select “Ok” when the phone asks for one final confirmation to do the desired operations. Now connect to the internet via Wifi or 3G and select “Sync All” from the “Account & Sync” Menu under settings. See Image - GMail create a new sync account - 1 and select "Sync All"
You should see a “Sync” Icon in the notification bar that will vanish as soon as the sync process completes. "Mail for Exchange" was first shipped as a separate application on Nokia phones to sync emails, contacts, calendar and notes with Microsoft Exchange Servers. However, it has been discontinued and the feature is built into the Nokia firmware, avoiding the need for a separate download. Visit this site to set up “Sync GMail” on your Nokia phone. As soon as you complete the email setup process, your phone will automatically sync with your GMail account. After the phone has completed sync, you should see your contacts in your Nokia Phonebook. After you have transferred your contacts, disconnect / delete your GMail sync account from the device you will not be using. You may opt to discard the GMail account altogether if your primary aim was only to transfer contacts. However, GMail provides a good backup solution, so you may let them sit there (just in case you lose your phone). You may choose to regroup your contacts again in GMail to make your GMail Address book look a little less messy. Do it via the GMail web interface and your phone will take care of everything when you sync it again. There is an option of Nokia Sync in Nokia phones but it works only between Nokia brand of phones and is probably not supported with Android phones. I have not found a simple way to transfer contacts via this method. Using People, you can view contacts stored in multiple email accounts in one place. You may choose to view people from Facebook or multiple Google accounts. Tapping a Contact icon opens a short menu that will allow you to call, view, message, email or visit the Facebook profile of the person (the last two options work only if the contact details includes an email address and is linked with a Facebook profile). Tapping the contact name will open the contact details. Long Press the Contact Name and you will get a context menu to manage the contact. When viewing contact’s details, tapping “Thread” displays all sorts of communication such as messages, call history and emails from that particular contact. When viewing contact’s details, tapping “Updates” will reveal its Social Network Updates where you can post comments without opening Facebook or some other application. 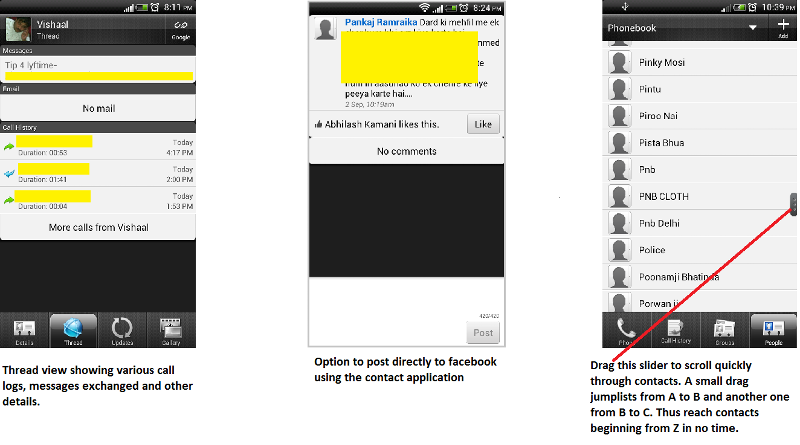 In the main view of the Phonebook application, when you hold and drag the screen up or down, a slider appears. Release your hold and grab the slider. Moving it up and down allows you to jump to your contacts alphabetically, eliminating the need to scroll through a long list. There may be times when you want to hard reset (factory format) your phone when you will lose all user data. You can save your contact data to your Memory card that can be restored later. The "Import / Export" option in the context menu helps to backup your contacts to your Memory Card and restore them respectively. HTC provides a feature to link similar contacts, which eliminates the dilemma to view the same contact (present in different accounts) thus increasing work efficiency and saving time. There is an option to de-duplicate contacts that may have resulted out of multiple copy operations. Other options that are fairly common to other phones like Groups, blocked callers and sharing individual contacts are very much there. 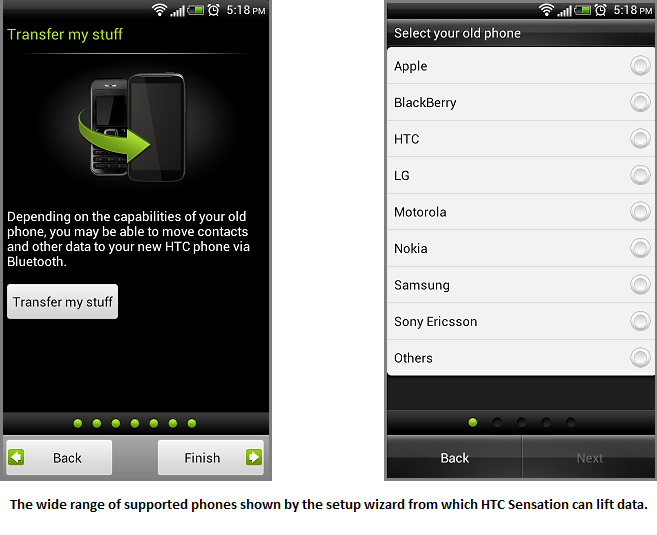 Htc sync is a Windows application that helps backup / manage data between your PC and your HTC phone. However, one big drawback that has not been advertised is that HTC Sync will only sync contacts which you have created on your Phone – aka Phone Contacts. Contacts are solely managed / synced / backed up with the server where they reside and not with your PC. Personally, I would not advise anybody to create / store Contacts in this section of the People application as it requires manual intervention every time. Yes, you do need HTC sync to backup your Pictures, Videos and other stuff. This is definitely not the last one of the series of HTC Sensation articles that I have decided to write and I'll be continuing it further with a Part 4. Hope you enjoyed it and found something which you were not aware of. If you found the article helpful, please vote "Yes". Feel free to post a comment if you have anything to share.